Many States Now Have $2 Gasoline, Analyst Says : The Two-Way An analyst from GasBuddy.com says 24 states have at least one station with the price per gallon at $1.99 or less. 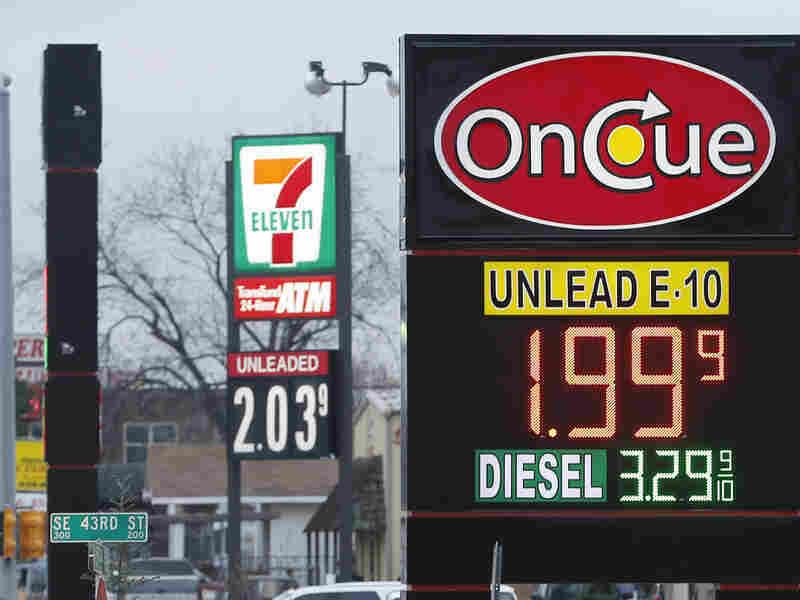 On Cue in Oklahoma City, was reportedly the first station to lower regular unleaded below $2 a gallon. Now, 24 states have $1.99 gasoline. Remember when we told you earlier this month that a gas station in Oklahoma City had lowered its price for regular unleaded to $1.99 a gallon? Well, now that trend is nationwide: GasBuddy.com, which monitors prices across the country, says the $1.99 sign is up over pumps in 24 states. The national average is at $2.43 a gallon, but at one filling station in Springfield, Mo., it was only $1.93. According to GasBuddy, Lubbock, Tex., had the lowest average price ($2.02) and Honolulu the highest ($3.50). In the lower 48, Burlington, Vt., had the highest average price at $2.95. You can thank increased production in the U.S., where many of us are driving more fuel-efficient cars than ever before, along with OPEC's decision to hold firm on output despite an obviously growing oil glut. And the end of the price drops isn't over yet, according to Patrick DeHaan, GasBuddy's senior petroleum analyst. "It's not guaranteed, of course. But we think they'll drop a little more, 5 to 15 cents a gallon," he tells USA Today. But, because of higher fuel taxes, some states won't crack the $2 a gallon barrier, DeHaan says. "The most recent gas-price plunge was triggered in September when Saudi Arabian oil officials voluntarily cut crude oil prices, DeHaan said. "The average car has a 12- to 15-gallon tank, so customers are keeping at least $14 to $17 more in their pockets now compared with six months ago. SUV and truck owners, the ones with even bigger tanks, are feeling even richer after a trip to the pump."